Director: Steven Spielberg. Cast: Djimon Hounsou, Matthew McConaughey, Anthony Hopkins, Pete Postlethwaite, Morgan Freeman, Stellan Skarsgård, David Paymer, Nigel Hawthorne, Anna Paquin, Arliss Howard, Jeremy Northam. Screenplay: David H. Franzoni (from the novel Black Mutiny by William Owens). Steven Spielberg's Amistad retrieves from the dark swamp of nearly-forgotten history a fascinating moment in American history when a ship full of slaves mutinied against the men who had captured them and packaged them like cargo. 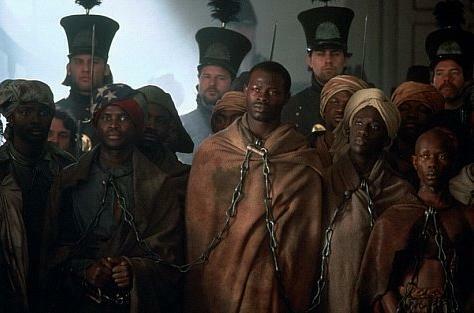 The slaves, led by a man named Cinque (Djimon Hounsou), commanded the last remaining sailors to return them to Africa but were instead conveyed to New York, where they were brought to trial for murder. The plight of these Africans became such a legal and human quandary that their fate was contested at every level of the American judiciary, ending with the United States Supreme Court. Amistad is valuable as history but strikingly problematic as filmmaking. The film cannot quite disguise the talents of the filmmakers who have created it, but it always smacks distinctly of retelling a story rather than actually recreating an incident. Matthew McConaughey receives a great deal of screen time as the young, unproven (and therefore Grishamite) lawyer who first takes Cinque's case in a regional district court and who grows further and further invested in the stakes of the case. The figure of the compassionate white civil servant has grown utterly shopworn as a device for telling what should be the story of non-white persons or cultures in crisis. Amistad, however, filmed from a clumsy and rushed-seeming script by David H. Franzoni, presents its other characters in such stilted and unelucidating ways that McConaughey's blue-eyed crusader becomes the most credible, compelling figure in this strange stew. Morgan Freeman and Stellan Skarsgård wander through the picture as abolitionists, but they never take on any distinct personality or crucial force within the plot. Pete Postlethwaite and Arliss Howard, fresh from Spielberg's The Lost World: Jurassic Park, make cameos as, respectively, a boo-hiss racist lawyer and Southern Senator John C. Calhoun, but neither of these charismatic players has enough room to affect the shape or impact of the picture as a whole. The most disconcertingly drawn characters are those of Hounsou, as the ostensible hero, and Anthony Hopkins, playing former president John Quincy Adams, who speaks on behalf of Cinque's cohort before the Supreme Court. (Adams served at that time as an associate justice of the Court.) Hounsou transmits unfakeable charisma in his performance as Cinque, who actually swayed a jury in one of his trials with an eloquent speech in an African tongue they could not even understand. Still, the script increasingly sidelines him in favor of courtroom theatrics and the political machinations between Nigel Hawthorne's Martin Van Buren and, most memorably, Howard's Calhoun. Worse, Spielberg and cinematographer Janusz Kaminski, a formidable cameraman even in dreck like The Lost World, frequently shoot Cinque in dark silhouette or slavering close-up; both approaches linger on Hounsou's formidable musculature, presenting him more as a powerful object worthy of marvel than as an embattled, articulate person. At crucial moments on board the Amistad, the ship where the mutiny occurs, Spielberg does not even translate Cinque's speech with other Africans, leaving us at a curious and maddening distance from the thoughts and impressions of these characters. By contrast, the Spanish navigators of the Amistad, who never express anything that cannot be surmised from their behavior or expressions, are subtitled on every occasion when they speak. Hopkins, meanwhile, who secured an Oscar nomination and the lion's share of critical adulation, has an essentially unplayable role as the ex-President and great defender. John Williams, whose score for Amistad is treacly and bombastic even by his own dubious standards, cues mawkish strings and delicate melodies every time Adams appears. The character spends many of his scenes meticulously potting and tending to his plants and flowers, includingget it?African violets. Hopkins handles his concluding monologue with great, understated technique, but elsewhere he plays the sort of doddery, sweet-willed gent that was Edmund Gwenn's stock in trade: the Santa Claus of Supreme Court argumentation.